BCBSNC offers information about health insurance plans during open enrollment and during the busy holiday shopping season. CHAPEL HILL, N.C. – Beginning Nov. 8, shoppers at Durham’s Streets at Southpoint Mall will have the opportunity to learn more about BCBSNC health insurance products – including its new, lower premium offering, Blue Advantage SaverSM – at the company’s retail kiosk. 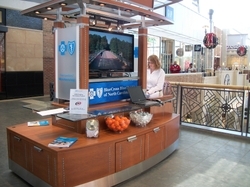 BCBSNC is piloting the kiosk during the months of November and December to test ideas for future retail opportunities. The kiosk, which will be staffed by trained BCBSNC employees, will include a sales center to provide prospective members information, support health plan selection using BCBSNC’s “Buy Online” tool via secure, wireless connection. Staff also can assist existing BCBSNC members with benefit and claims questions using BCBSNC’s “My Member Services” tool via secure, wireless connection. About 30 percent of the 15 million shoppers who visit the Streets at Southpoint each year shop during November and December. BCBSNC’s retail kiosk will be open during mall hours: Monday through Saturday 10 a.m. – 9 p.m. and Sunday 12 p.m. – 7 p.m.
Consumers throughout North Carolina can get free rate quotes for BCBSNC products, including Blue Advantage SaverSM (a new, lower-premium product), by visiting bcbsnc.com.